Garage Door Openers, Charlotte | Doors by Nalley, Inc.
As a certified dealer for Chamberlain garage door openers in Charlotte, NC, we offer the highest quality products. Garage Door Openers in Charlotte – Deciding between garage door openers can be difficult. There are countless options with various features to consider, and with so many different styles, it’s easy to get confused. But at Doors by Nalley, Inc., we know everything there is to know about garage door openers and can help you decide which options are best for you. As a certified dealer for Chamberlain garage door openers, we offer the highest quality products. We carry both chain drive and belt drive options of these dependable garage door openers, and each has unique features that cater to many uses. For both the belt drive and chain drive, we carry several different models that offer even more variety. Belt driven garage door openers are equipped with more horsepower, which is ideal if your garage door is being used on a daily basis. 5 of our 7 models that are belt driven come with a battery backup feature in the case of a power outage, and 6 can be operated from a smartphone. They are a very popular option for many of our customers because they are the highest in quality and are extremely quiet when opened. If you still want a high-quality garage door opener without the higher cost, a chain driven opener may be the best fit for you. These are just as reliable as more expensive options, but do not come with the same amount of special features. 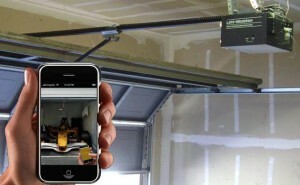 Chain driven garage door openers have less horsepower and come without the battery backup or capability to connect with your smartphone. If all you need is a simple, reliable garage door opener, then chain driven will best suit your needs. At Doors by Nalley, Inc., we carry 10 different chain driven models, so you’re sure to find the perfect one for you. Contact us today at our office in Charlotte, NC, and the experts at our store will be happy to help you decide which garage door opener is best for you. Here at Doors by Nalley, Inc. we offer only the highest quality garage door openers for our customers in Charlotte, Mooresville, Hickory, Statesville, Denver, Huntersville, Gastonia and Lake Norman, North Carolina!